Like all Ambu BLS manikins, the Ambu Defib Trainer W has the patented hygienic system that eliminates the risk of cross infections. All trainees receive their own face piece and head bag for the training. At the end of the training, the face piece can be cleaned and the head bag is discarded. A truly 100% hygienic way of training. 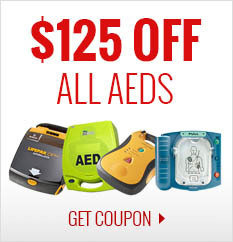 Realistic defibrillation up to 400 joule can be taught and practiced. 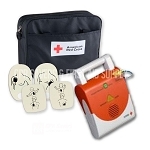 The Defib Trainer W comes with 3-4 lead ECG. 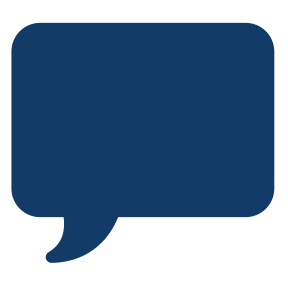 The CPR software is part of the wireless system in the Defib Trainer W. The CPR software analyzes and diplays the performance done on the manikin in real time. In addition, the CPR software can display and control the ECG. The virtual ECG provides 26 rhythms and 2 artifacts and can automatically detect defibrillation. 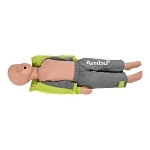 The Ambu Defib Trainer W does not need cables or wires, which means it can be placed in realistic surroundings away from computers and power supplies. This gives a great amount of freedom during training and because there are no wires or cables lying around, it gives an even more realistic scenario. 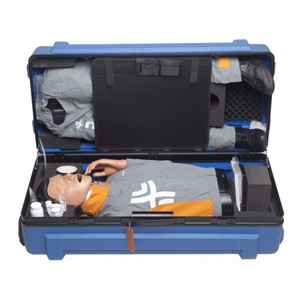 The manikin is also equipped with a mechanical monitoring instrument showing effectiveness of the resuscitation, including results achieved for ventilation volume and depth of external chest compression. Moreover, it indicates any stomach inflation and incorrect hand positioning. The airway of all manikins open only when the head is correctly hyper extended.